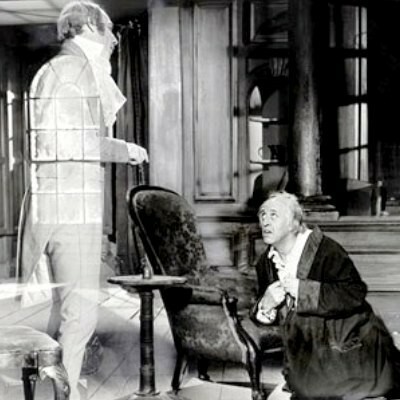 Scrooge: Alastair Sim and Michael Hordern lead a perfect cast in the best live-action adaptation of Charles Dickens’ A Christmas Carol. A Christmas Carol — The best animated adaptation of the same story is eerie and utterly original. Wonderfully, it features Sim and Hordern among the voice actors. How this wicked, blasphemous, sacrilegious tale became so popular in a supposedly “Christian” culture is inexplicable. In Luke 16:19-30 we read about the rich man who neglected poor Lazarus at his gate and was later in torment in Hades while Lazarus rested in the bosom of Abraham. The rich man asked that Abraham send Lazarus to warn his brothers of what awaited them if they behaved as he did, but Abraham said that if his brothers did not listen to Moses and the prophets, neither would they listen to someone rising from the dead; there is no point in sending such a warning. That is the clear and unmistakable lesson of this passage. He who hath ears, let him hear. But Dickens was having none of this; no, he decided that he could improve on the gospel and wrote this tale of a rich man hearkening to such a warning and being redeemed thereby. Let us all flee from Dickens’ story as from a deadly plague, or we will surely be tormented ourselves in Hades for our disbelief in the authentic Word of God. Besides which, Patrick Stewart deserves honorable mention for his 1999 performance as Scrooge. Agreed! Patrick Stewart was outstanding, and I think he hugged the original story a bit more closely than most other adaptations. But of course, I admit my favorite animated version is Mr. Magoo’s version. I love the songs most of all…. Allow me to recommend “Blackadder’s A Christmas Carol”. The Muppet Christmas Carol is lovely. Also wonderful is a TV version in which David Warner, who generally plays the devil or Jack the Ripper et al played a sad-eyed Bob Cratchit. Bill Murray’s Scrooged is the best — Kane should have won an Oscar as the Ghost of Christmas Present.